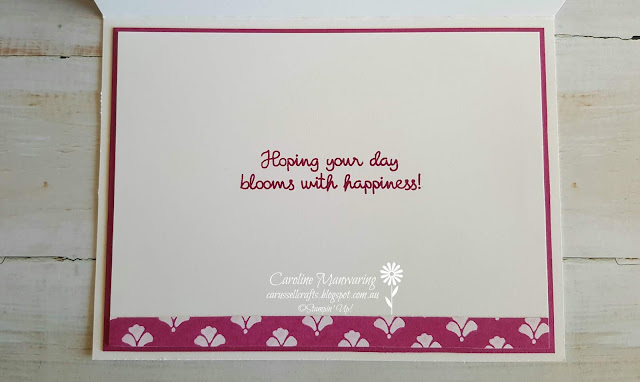 Carussell Crafts: AWH Team - May Blog Hop - Sharing the love of our In-Colours! 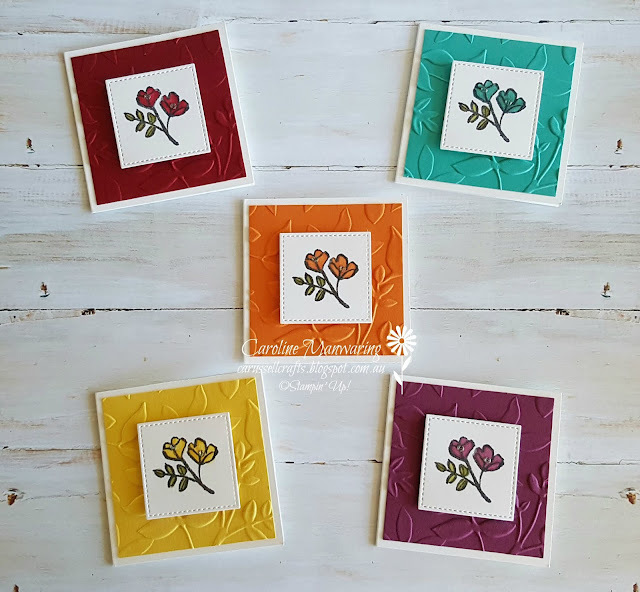 AWH Team - May Blog Hop - Sharing the love of our In-Colours! 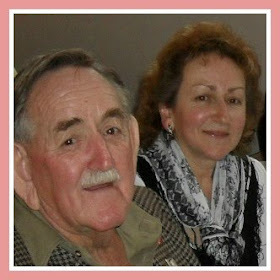 Hi friends and welcome to another Blog Hop with the Art With Heart team. Tonight the team are sharing their creative projects using the theme of In-Colours. 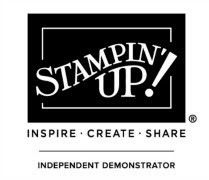 With our 2016-2018 retiring In-Colours, the current 2017-2019 colours and our NEW 2018-2020 In-Colours, at Stampin' Up! you are certainly spoilt for choice. If you would like to see all of our fantastic colours and wonderful new products, just contact any of the girls on the hop for a copy of the new 2018-2019 Catalogue. For my projects, I chose to feature colours from our current collection. If you asked me if I had a favourite colour from the 2017-2019 collection, my answer would be Berry Burst. It is such a vibrant, deep crimson colour. 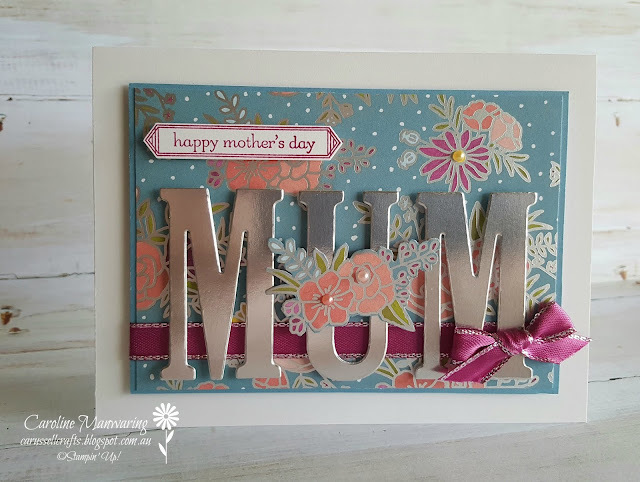 The card above is the one I made for my mum for Mother's Day last Sunday. I chose a pattern from the Sweet Soiree Specialty DSP which has two of the In-Colours in it, being Berry Burst and Powder Pink. The gorgeous Berry Burst Metallic-Edge Ribbon really enhances the silver foil lettering and it makes the whole card pop! A little bit of fussy cutting, some beautiful new pearls and a Berry Burst sentiment finish the card front. Inside the card I attached a strip of the DSP to the writing panel and another fussy cut flower sprig. 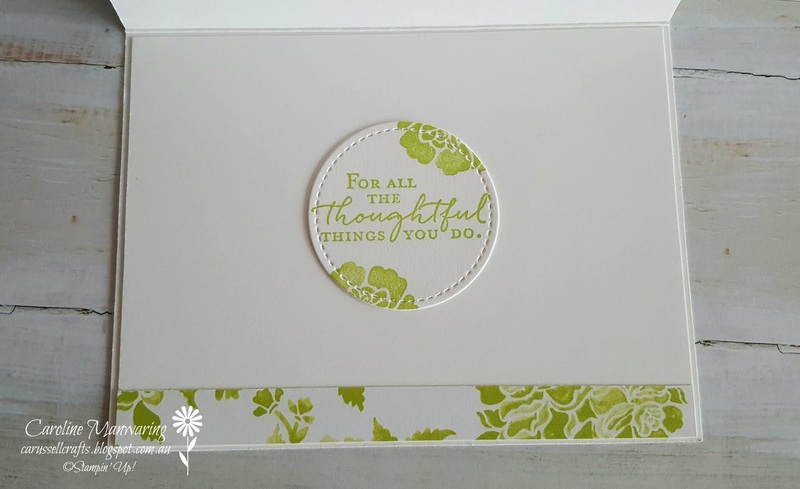 This next card features my second favourite colour - Lemon Lime Twist. This is the same layout as my first card except this time I ran the letters through the Scattered Sequins Dynamic TIEF, I really love this effect. 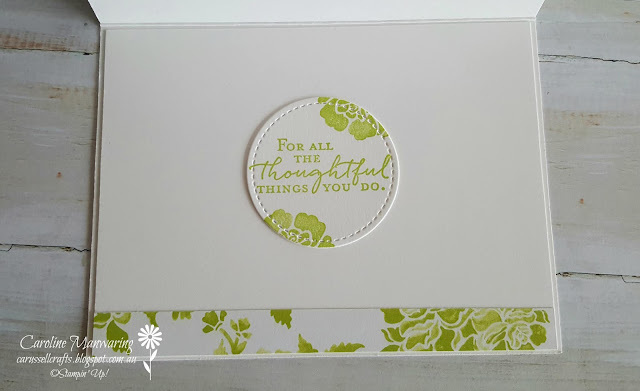 As on my first card I have used some Metallic-Edge ribbon, this time in Whisper White, that I wrapped around a panel of Fresh Florals DSP and Lemon Lime Twist cardstock. 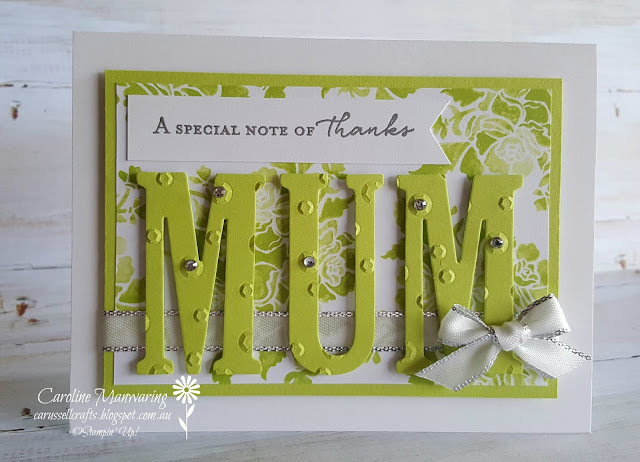 I silver embossed the sentiment and added a few rhinestones for some extra sparkle. Inside I stamped a sentiment and the flower motif, from the 'Floral Phrases' stamp set, and cut it out with a stitched shape circle die, and again I added a strip of the DSP. I made this card for a very special 'mother figure' in my life and she loved it. Below is the third and last of my cards and it features all of the 2017-2019 In-Colours. On this card I have combined retiring products with new. 'Varied Vases' is a stamp set that will be available in the new Stampin' Up! catalogue and it has a coordinating punch. Here I have stamped the vase in Tranquil Tide, the tulips in Berry Burst, Powder Pink and Fresh Fig and the stems and leaves in Lemon Lime Twist. I used another pattern from the Fresh Florals DSP and some more of the gorgeous ribbon. The birthday sentiment is stamped - you guessed it - in Berry Burst and is just one of the sentiments from the stamp set. 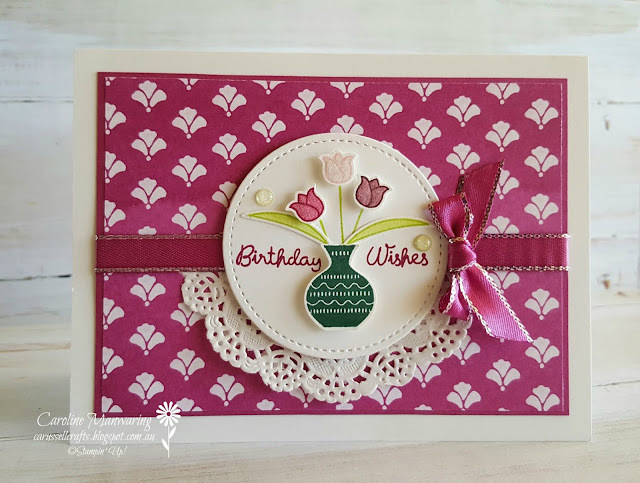 I have to confess that I rarely use the Delicate Doilies, but I'm so glad I did on this card. I brushed on a little Wink of Stella to the tulips and added a couple of the Glitter Enamel Dots to the stitched shape circle. Thank you for joining us on our hop tonight. If you're already hopping you may have come to me from the lovely Ros Davidson, but hops are full circles so you can start anywhere and keep clicking the 'next blog' button at the end of each post to end up back where you started. Now it's time to hop over and see what the lovely and talented Sharon Davern has created. If you find a broken link or have come to this blog hop from a different entry point, here is a list of tonight's participants. 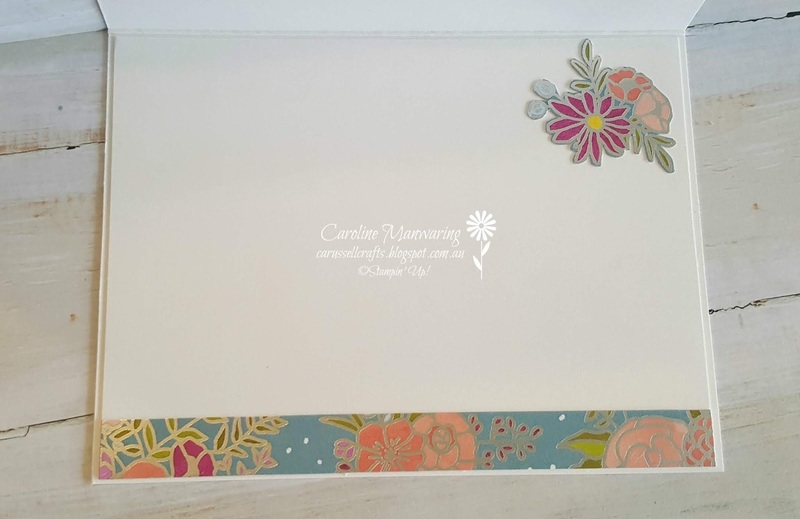 Lovely cards and I love how you used all 5 of the current in colors on the vase card. So pretty! I really love how you have tied your ribbons, especially the ones with the die cut letters. Thanks for being part of the Art With Heart Team monthly blog hops. Your bows are perfect, Caroline and I totally agree about Berry Burst being a favourite of the in colours. It's such a gorgeous tone and I love your use of it in your vase card. It's a beautiful country card! Aww, these are lovely! I can tell you love Berry Burst, as you've really made it the star of your cards. I especially love the first card!